Small, in a BIG way! Improve your optics performance, while lowering cost with this interferometer for micro optics control from Apre Instruments. 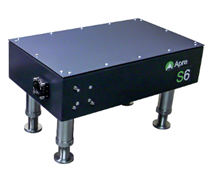 Easy-to-use 6 mm aperture, S6|HR: 500 µm to 6 mm optics. 4.2 Megapixel camera, for 16 µm resolution. Spectrally Controlled Interferometry (SCI): No back reflections. Easy setup in long coherence mode. Production floor ready Vibration Tolerant PSI. REVEAL Analysis software on Windows 10 64 bit OS.